Welcome to the homepage of the Salsa Dancing in Augusta. 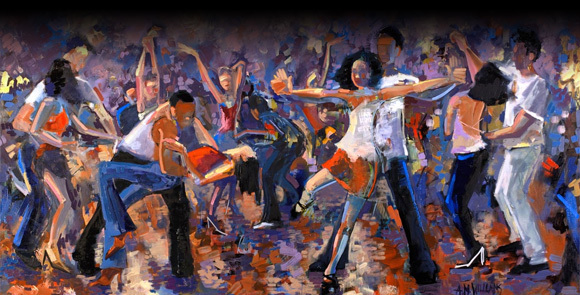 The Augusta Salsa Club group strives to support the growing number of dancers in Augusta who truly love Salsa and Latin dancing. Our aim is to provide resources and information for our members. We are an open group that is not affiliated with any one studio or club. If you have time or resources to support Salsa and Latin dancing in Augusta, or have ideas that would better the group, we encourage you to post them. Also, please check out our Facebook Group, Augusta Salsa Club. Join the group to stay in the loop on upcoming events, get announcements, meet the members, and invite your friends. The Sunday Social, endorsed by The Augusta Salsa club, happens every Sunday at Mi Rancho Mexican Restaurant, 3064 Washington Road, across the street from Rhinehart's Oyster Bar, near I-20. Show up at 7pm and go left when you enter the front door. We dance in the "Fish Bowl". It'll be a great time with the areas "Hottest Dancers". $5 at the door. Come one, come all. Don't forget to bring your appetite because they serve some of the best Mexican food and Drink in town. The 30 minute beginner lesson is at 8:00pm so order your food early. The social is a non-affiliated, drug-free, and zero-tolerance environment. Check back soon for pictures from our first event. If you have any pictures you would like to submit, please send them to joshua@waetech.com. If you have any videos you would like to submit, please post them on facebook and then let me know about the video so I can add a link to it here. We'd like to thank those in the local area who have provided more to the Augusta Salsa Club than they may know. Without the encouragement and resources provided by our supporters, it would not have been possible to get the group organized. We would like to thank the following (in alphabetical order): Bill Doker, Eduardo Diaz of A&E Dance Studio, Jennifer Young Sun Collado, Sherwin Loudermilk of Metro Construction Group, Stephanie Suarez, Steve Neely of The Augusta Tango Club, and Teena Marie of Ballroom in Motion. I would also like to thank each and every person who has said "great idea" and promised to come to one of the socials. Without each of you, and your love for dancing, the world would be a much darker place. J's Salsa Social. It is every first Saturday of the month at Academy Ballroom Cumberland on Cobb Pkwy. The Salsa Jam. It is every third Saturday of the month at TakeHold Ballroom on Miami Circle. There are a few places to dance salsa in Augusta. Below are some of the places that offer regular dances. Copyright © 2008-2019 Augusta Salsa Club. All rights reserved. Designed and Powered by WAE Technologies, Inc.